Procedure section of TCM Critical Service Bulletin (CSB) No. 93-13, dated August 12, 1993.
found anywhere in the assembly, prior to further flight replace with a serviceable assembly. this AD prior to installation. 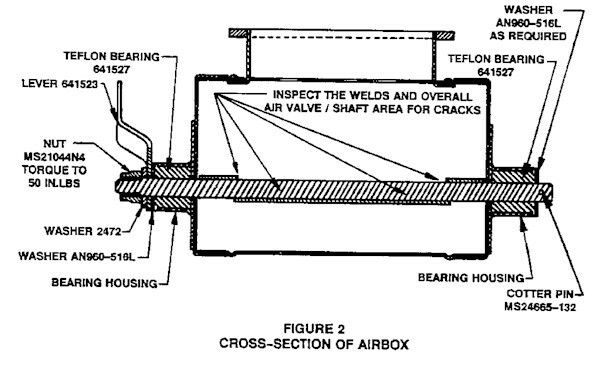 assemblies with the air filter included, corresponding to airboxes, P/N's CE11142 and 639815.
action to the inspection requirements of this AD. who may add comments and then send it to the Manager, Atlanta Aircraft Certification Office. airworthiness directive, if any, may be obtained from the Atlanta Aircraft Certification Office. airplane to a location where the requirements of this AD can be accomplished. Capitol Street NW., suite 700, Washington, DC. 1993, which contained the requirements of this amendment. identified in paragraph 2B of the Inspections Procedures set forth in this bulletin. 2) All new engines identified below. kits P/N 641689 must be replaced with current production kits. 1. Remove engine cowling to gain access to the carburetor air intake housing assembly. 2. 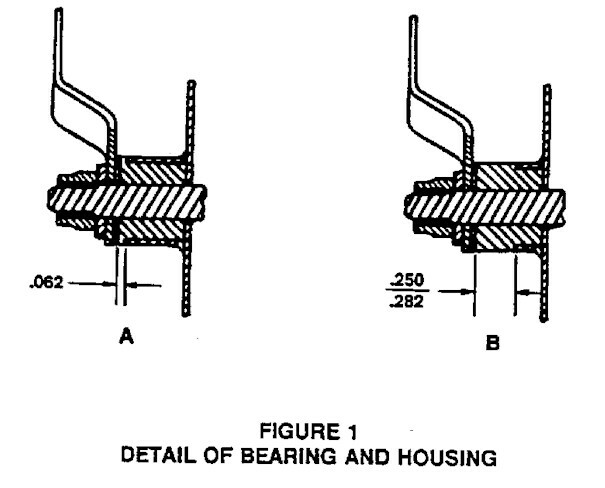 Measure the exposed portion of the Teflon bearing. See Figure 1. 100 hour inspection and any discrepancies corrected. this bulletin, with repetitive inspections at 25 hour intervals until the assembly is replaced. valve adjacent to the welds for cracks. See Figure 2. FURTHER FLIGHT IF CRACKS ARE FOUND ANYWHERE IN THE ASSEMBLY. wear on the bushings, shaft and lever. Verify that the air valve operates freely with no binding. CORRECT ALL DISCREPANCIES BEFORE FURTHER FLIGHT. cases be performed without removal of the engine cowling. hour intervals in accordance with this bulletin. A replacement assembly must be ordered from TCM as soon as bulletin affectivity has been established. Orders will be filled as replacement assemblies become available. hour labor for removal and installation. Claims may be filed through any TCM distributor.